A low-cost, stylish presentation box for your prints, projects or finished jobs. 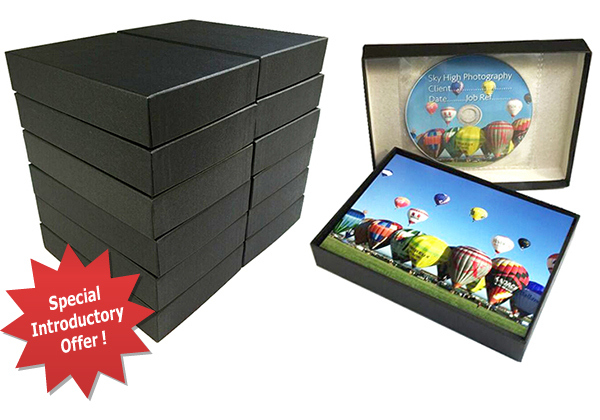 Personalise / Brand the Box & DVD to your Individual Needs! Available in A2, A2+, A3, A4, 5" x 7" and 6" x 4"
Store your finished jobs or work in progress in both printed and digital form with the all new Digital PrintBox. The Digital PrintBox is a matte black heavy duty card box and lid ideal for storing finished jobs, projects and work in progress. Included with all Digital PrintBoxes is 1 x FREE printable 4.7Gb DVD/R fixed to the inside lid, which is capable of storing over 200 images at 20Mb each.